This is a story I have been meaning to tell in full for quite some time, because I too was once in a position on the other side of that screen looking for advice, answers, and some way to make sense of the onslaught of emotions and uncertainty raging through me. Know that this is nobody’s fault, you are not alone, many have been where you are right now, and many will be in the years to come. Early in 2012 my wife and I decided it was time to work on baby number two. Shortly after we knew we were pregnant we discovered that my wife had an umbilical hernia, preventing her from lifting anything too heavy the duration of the pregnancy. Our first daughter, Kara, would be turning two years old that October which meant that all lifting duties involving her fell to me as well. At 20 weeks we had our standard ultrasound appointment, we found out we were having another girl and I was overjoyed. But the sonogram also revealed our little girl had the typical markers for Down syndrome. We were told we could have an amniocentesis done to be sure, as sometimes people want to know these things to decide if they want to terminate the pregnancy. Is that what we should do? Terminate the pregnancy? What kind of life could someone with Down syndrome live? Could they be happy not living a normal life? I started losing myself in all of these questions, these emotions, and this grief. I really didn’t hear much else that was said that day. I felt my wife’s hand, squeezing mine, reassuring me that we were in this together and things could be okay. Eventually we somehow ended up back home and we cried… a lot. I shut myself in the bedroom and cried. I asked God or whoever would listen why this was happening to us, asked how we could go on and be a normal family, and mourned the idea of a normal child and family. She was online finding out everything she could about the path that lay before us while I allowed grief, confusion, and anxiety to take the wheel for me. The next couple of days were a blur. I took leave from work to deal with myself and process things, we met with my wife’s OBGYN and decided to have the amnio done as soon as possible (which ended up being that Friday). We called and talked to our families and received much support in return. I still had a lot of doubt, and it was mostly in myself. Could I look at her the same way that I do with Kara? Would I be able to love her the same? Would I want to avoid my own child? Could I be strong enough and good enough to be able to deal with this and be the father she needs? Would my life be over and just spent doing therapy with her from now on? I returned to work the following Monday, and my wife ended up meeting me for lunch. We were both anticipating what the results would be, and discussed the future. As far as we were concerned there was only one path forward and we were on it and we would do whatever it takes no matter what the results of the amnio were, but it was still something we felt we had to know now rather than be surprised by on the delivery day. The following day we got preliminary results back and we were told what we had already known to be true, that our daughter will be born with Down syndrome. As time went on more issues occurred, my wife ended up having placenta previa and gestational diabetes, while still dealing with the hernia which couldn’t be operated on until after childbirth. So while inside I was a mess I did my best to switch to being a rock externally. I needed to be strong for my wife and for Kara and I kept all of my fear and uncertainty at bay under the surface. We saw a genetic counsellor to learn more about Trisomy 21 and the health issues our baby may have, such as issues with the heart and intestines. I wasn’t raised that way and it’s a bit foreign to me, but my wife is. During this time we went to church a lot and at home I prayed a lot. 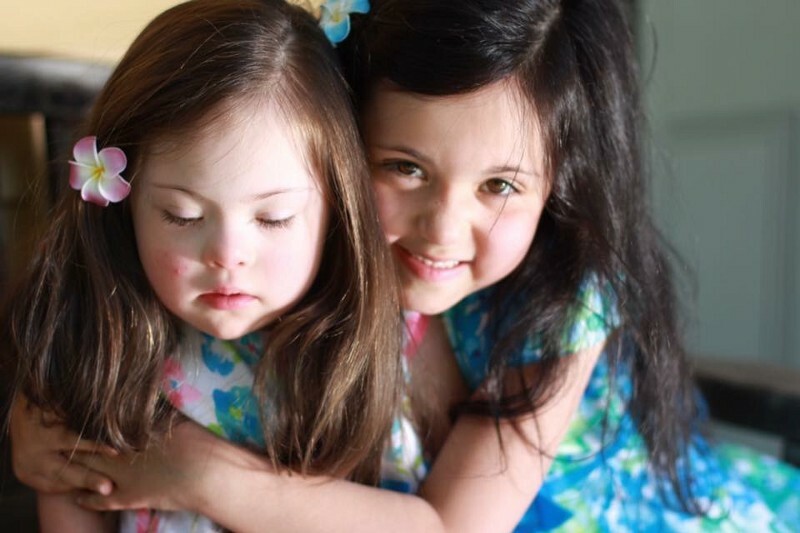 I prayed for my daughter to not be born with Down syndrome at first, and over time that message changed. I started praying for her to be born healthy, with none of the defects and health conditions that could come along with it. I started praying that I could be strong enough to be the father I need to be to her and Kara. That we could be a happy and healthy family no matter what. My wife continued to research what we needed to be prepared for starting from the moment of her birth, including state run early intervention programs. I spent some time reading other people’s stories (much like the one you are reading right now) and just preparing myself to be the man I needed to be. November came and late at night on the 8th my wife went into labour. It still took me a while to grasp it. We were here. We were done. The end of all of the heartache, pain, and complications we endured this year… it was finally over. I saw my newborn daughter for the first time and the weight was lifted so fast that I literally became dizzy and had to have a seat, and began feeling the onset of a panic attack. I had watched Kara come into the world, and felt nothing but joy…why was this different? Teresa did have Down syndrome, that much was obvious when I saw her, and I still didn’t know what to think about it. I suppose part of me was hoping the amniocentesis was wrong, that somehow she would come to us without disability, but I knew in my heart that wouldn’t happen. Looking at her I wasn’t disappointed in the fact that I was wrong, but I was more just kind of shocked that she was finally here and we were done with this portion of our journey. It wasn’t until afternoon that I really got to hold Teresa for the first time and spend some time alone with her as my wife slept and our family had left the room. It was there, when she was in my arms and I looked down at her, that all felt right in the world. This is how she was meant to be and SHE chose to come into MY family. Teresa and my wife fought together for this moment, and the thought of that was just so powerful to me, and then all of the uncertainty and negativity going through my head the last 4 months due to her chromosomal abnormality came back to the surface in an overwhelming wave of guilt and I just lost it. I cried and told her how much I loved her and I would and will do anything for her. I looked down at her beautiful peaceful face and knew everything was going to be alright. Sure there will be challenges along the way, but we will be ready to face them together. She was born without any of the things we feared: no intestinal issues, no congenital heart defects. She did fail her hearing tests at first, but let me tell you that girl’s hearing is just fine today! Four years later as I type this, remembering those feelings and thoughts of uncertainty feels so foreign to me. She is such an amazing girl and I am proud to be her father and I know she is destined for greatness. She helps make every single day that much more beautiful to live, and I can’t imagine being on any other journey in life than this one. A version of this post originally appeared on Medium and was republished here with permission.